Yesterday, the Lodi-Woodbridge Winegrape Commission announced that James Trezise of the New York Wine and Grape Foundation was named the Wine Industry Integrity Award honoree for 2006. Created in 1998, the award honors individuals who have conducted their careers with integrity while making significant contributions to the wine industry. The award will be presented at a dinner in honor of Trezise at the Wine and Roses Hotel in Lodi, California, on Friday, November 3, 2006. Trezise has been President of the New York Wine & Grape Foundation since its creation in 1985. The Foundation is a private, not-for-profit organization that sponsors research and promotion programs in support of New York grapes, juice and wine. Jim is a real champion and in many ways the voice of New York wines. Congratulations to him...even if he has never returned one of my emails. Most of the white grapes had already been picked (thankfully) but some wineries lost some of their red grape crops. In fact, a couple lost it all and didn't make red wine in 2005. With rain, sometimes heavy rain, over the past several days, you can't blame vineyard managers, winemakers and winery owners for being a little nervous. And, after a forecasted respite tomorrow, the remnants of Hurricane Ernesto arrive this weekend, bringing more rain. It's only the end of August, so there is still time for the grapes to recover before harvest. Let's just hope these rains stop soon and we get a few days of full, warm sun and high winds. This week over at Hamptons.com, my Corks of the Forks column actually leaves Long Island and its Forks for a trip to Cooperstown, NY, land of baseball...and Belgian beer. Brewery Ommegang has long been on my upstate New York "to visit" list and last weekend I was finally able to cross it off. They actually have wide distribution both on the East and West Coasts...so if you ever see a bottle (typically cork-and-cage topped 750ml), pick one up. I can't recommend them enough. I bought a mixed case myself -- some I'll drink now. Some I'll age a few years. Sheldrake Point -- both the geographical point and the vineyard -- jut prominently from the western shore of Cayuga Lake and those vineyards stretch almost the whole way to the water. The combination of deep glacial soils and the moderating effects of Cayuga Lakes deep waters provide superior conditions for growing fine quality vinifera wine grapes -- a unique microclimate that they call the 'Sheldrake Effect'. The 400-foot depths just off of their beach heat and cool more slowly than the surrounding land. The resulting hillside microclimate lengthens our growing season to 170 days, more than two weeks longer than surrounding counties. 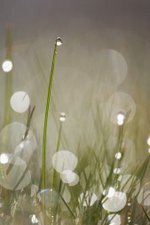 These unique growing conditions keep bud break from happening too early in the spring, lower daily swings in temperature, and the chance of early autumn frosts. The soils at Sheldrake are predominantly well-drained Howard gravelly loam, derived from shale, limestone and slate, and considered ideal for grape production. To most, including me, the Finger Lakes region shines with white wines but struggles with reds. Many reds from the region never achieve full ripeness, leading to lean, somewhat green tasting wines. This wine avoids those under-ripe pitfalls. With this wine, winemaker Dave Breeden has made a cabernet franc to be proud of. Medium crimson in the glass, the aromas are intense and ripe with raspberries, a little smoky oak and a whisp of fresh mint. On the palate, the intensity continues with straightforward raspberry and blackberry flavors, smooth tannins and just enough oak to keep it from being boring. Absolutely gulpingly delicious for $14. where plantings of the two grapes are intermingled. planted in 1983 are pinot blanc — and originated in Alsace. and chalk. The long, elegant finish offers a salty tingle of acidity. This is a new benchmark in North Fork pinot blanc. Pittsburgh (my beloved home town) falls within the borders of Pennsylvania, a commonwealth whose liquor laws barely have crept out of prohibition, so it should come as no surprise that it's not the most wine-savvy city east of the Mississippi River. But, with one of the city's two major newspapers publishing stories like this one (thanks Beau), is there any hope that it will change? It's disturbing to say the least. Elizabeth Downer, the Pittsburgh Post-Gazette's restaurant critic recently took over as it's wine critic (cheers to the PPG for finally having a wine critic) as well. And, while her biography sounds impressive (see call out) one can't help but wonder what wine world she's a part of if she's lauding aging wine in oak as "wine-making's hottest trend". "The flavors that oak imparts to wine have become so fashionable that it's a challenge today to find a wine that is totally oak-free." Fashionable? Hard to find un-oaked wine? That is absolutely ridiculous. If anything, I see a trend of wines displaying less (or no) oak character, at least locally. Whether good or bad is up for debate, but there are certainly plenty of no-oak wines on the market beyond Beaujolais and Pinot Grigio. And even if oak barrels are being used more now, it's hardly the "hottest trend" in winemaking. Then again, in her first wine column she wrote "My advice to you is, don't buy stock in wine bottle manufacturing companies. It looks as if boxed wine might be the way of the future." Wait, wouldn't that make alternative closures/containers a hot trend? Maybe one that is hotter than oak barrels? What about organic/biodynamic? What about focusing on terroir? Manual de-alcoholization? Those all seem "hotter" than barrique and I'm sure there are many more. I've emailed Ms. Downer to find out what led her to this conclusion, but I have yet to hear back. Until I do, I'll reserve at least a little judgment, but this sure seems like an uninformed opinion that is doing her readers a disservice. 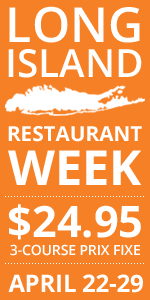 It's still a couple months away, but the first ever Long Island Restaurant Week has been announced. It will take place November 5 - 12 all over Long Island. Looking at the website, there just aren't many restaurants signed up yet. Hopefully that will change because this definitely has potential. Check their site as the week approaches, hopefully there will be more, and better, restaurants involved by then. In one of my (yet to be published) novels I created a Belgian-style restaurant and brewpub in the Long Island town of Port Jefferson. This little beer fantasy of mine is not so far from reality. For those of us on the East End who are willing to drive into Nassau County, we can get our taste of Belgium at Waterzooi in Garden City (850 Franklin Avenue). Denise and I decided to take in the Sunday Brunch at Waterzooi and we were pleased to find ample parking in the public lot right out front. The interior of is reminiscent of a cozy underground crypt, but despite the grotto-like ambiance, we elected to sit out on the patio and experience our beer and our meal in bright and breezy surroundings because it was such a nice day. For starters we ordered the Petrus Old Brown Ale from Brouwerij Bavik, a slightly sour Flanders Oud Bruin that was light and thirst quenching. The Petrus was served from a bottle (as opposed to the tap). Our waitress (who looked astonishingly like Audrey Tautou in Amelie) poured the bottle at the table. She roused the yeast prior to the pour by working the bottle in her palms, then decanted half the bottle, then swirled and completed the pour. I probably wouldn't have been that rough with bottle if I was pouring for myself, but I have yet to find a Belgian-style restaurant whose wait-staff doesn't have the impression that American Belgian beer enthusiasts want to drink a yeast colloid instead of a bright beer. I heard recently that in Germany one beer bar (at least) was serving the yeasty dregs of it's Hefeweizen kegs in shot glasses for patrons who just can't get enough yeast. I suppose there's nothing technically wrong with dumping a load of yeast into your glass, just be aware that the beer will taste very different with the yeast than it does without. Yeast tends to impart a bready character to the beer and it mutes any crisp tartness that may be present. Try this experiment at home with a Witbier: Decant carefully the first half of the bottle into one glass, then swirl and rouse the yeast and pour the rest into a different glass. Sample and compare. Take note of which you prefer. We also ordered Nostradamus from Brasserie Caracole, a dark, thick dessert beer that I thought Denise might like. She did like it, but we both agreed it was a better beer to end a meal with rather than as a starter, so we ordered a second round after splitting the Petrus Old Brown reserving the Nostradamus for later which turned out to be a good idea since I prefer Nostradamus at near room temperature and it was served to us that day at around 40 °F. For our next round we order two Wits: a strawberry Witbier called Frubee from Brouwerij Huyghe (makers of the famous Delirium line of beers) and the St Bernardus Witbier. That was the first time I had tasted either beer. I was totally blown away by just how much strawberry flavor the brewers managed to get into that 8 ounce glass of Frubee. Taking a sip of that beer was like sucking on the sweetest, ripest strawberry you've ever tasted. This too was a dessert beer, but it was light enough in the body to be refreshing. The St. Bernardus Wit was most impressive. I'd love to do a side by side taste test of Hoegaarden and the St. Bernardus Wit. My guess is that the St. Bernardus would put Hoegaarden to shame with respect to flavor and crispness. That's what I look for in a good Wit, lots of flavor, crisp tartness, and a dry refreshing finish. It shouldn't taste watered down or finish sweet. My impression of Hoegaarden has changed over the years. I believe Hoegaarden has been getting lighter in flavor, but that could just be the natural development of my palate as I seek more and more strongly flavored beers. When it comes to things like music, cars, sports, food or even clothes, Americans are adamant about their likes and dislikes. Why is it when it comes to the subject of wine, so many Americans act like a deer in the headlights? How often have you heard someone say, as you them pour a glass of wine – “I’m not a wine connoisseur…I really don’t know much about it.” Of course we know it’s partly due to the fact that most of us didn’t grow up with wine like kids in European countries. The “foreign origin” of wine creates a disconnect within our culture, resulting in an elitist image. And, because of the vast number of wines available to us, especially here in New York, the world of wine has become a difficult thing for the average American to understand and navigate. Most Europeans are raised with at least some understanding of wine from their own local region and country. They are not schooled initially in the wines of the world -- that’s something that takes time. Maybe the lesson is we should simply start by appreciating the wine in our own region before trying to understand the rest of the world. We’ve seen the slow changes occurring in American wine consumption, much of it due to the well-documented health benefits of wine as well as the abundance of good wine available at good prices. Still, the average consumer remains somewhat intimidated with the world of wine. Over half of all wine consumers report that they would like to learn more about it. This brings me to the topic of wine ratings. Much has been written regarding the use of the 100-point scale for wine evaluation. The amount of space needed to discuss all the merits and failings of this system doesn’t exist on this blog – but I would argue that most, if not all consumers could do better all by themselves. More and more wine pundits are telling us the 100-point scale is fast becoming a relic of decades past, when Americans needed the advice of an “expert” to tell them what they should like. Just last week, The New York Times covered the topic by interviewing a number of major players in the wine ratings world. All agreed that the 100-point systems used by Robert Parker and The Wine Spectator can be critical to a wine producers’ commercial success. At the same time however, most of these critics tell us they would like to see the system disappear altogether – that it has become in essence, a necessary evil in the wine world. Joshua Greene, editor and publisher of Wine and Spirits magazine states that “on many levels it’s nonsensical. I don’t think it’s a very valuable piece of information.” This comes in part from understanding that the 100-point scale is not an exact science. It’s actually not a science at all – it’s just a matter of opinion. This week, Hermann J. Wiemer Vineyard's 2005 Dry Riesling ($16) defeated 702 other New York wines to win the Governor's Cup, awarded to the events best wine. Dr. Konstantin Frank’s Vinifera Wine Cellars was named New York's "Winery of the Year" based on the number, and level, of medals its wines won. 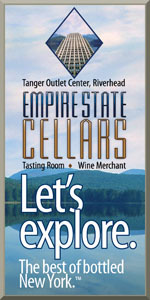 Sponsored and run by the New York Wine and Grape Foundation (NYWGF), a nonprofit statewide trade organization based in the in newly opened New York Wine and Culinary Center. Howard Goldberg reported in the New York Times, "The wine industry and influential wine periodicals treat the contest as the broadest, most representative index of the quality and styles of New York’s expanding wine industry." And, while probably true, I think it important to point out that not every winery (including some of the best) even send wines to this event. But, the tasters can only taste what is put in front of them. The wines are tasted blind and by professionals, so the results are legit. Why isn't there a sauvignon blanc category? My guess is because outside of Long Island, no one is growing or making it. But, on Long Island, no one is growing stuff like Niagra or Cayuga either. In fact, there are very VERY few non-vinifera vines here. A Finger Lakes bias? Maybe. I've heard grumblings of that locally. I think there should at least be an "Other White Vinifera" category like there is "Other Red Vinifera." What is the difference, for this event, between "Late Harvest" and "Ice/Iced Wine"? I only ask because Wolffer's late harvest chardonnay is made from grapes that are frozen in a commerical freezer, so wouldn't that put it in the "Ice/Iced Wine" category? Maybe. Maybe not. I'll have to see if I can find out. You've probably noticed that "50 States. 50 Wineries. 50 Weeks." has become merely 50 wineries from 50 states. That's just because it's been so much harder to gather samples than I anticipated. So, instead of doing one a week, I'll taste them as I can get them. The goal is still to taste, and write about, wine from each of America's 50 states. This time around, we head to the deep south -- Alabama -- and Will Creek Vineyards. I knew that this project would lead to tasting some interesting wines made from grapes outside of the Vitis vinifera realm, but the three Alabama wines I sampled were completely, off-the-charts unique...even if they tasted largely the same. You see, these wines were made with the muscadine grape (Vitis rotundifolia), which is native to the southeastern United States. It's found in the wild from Delaware to the Gulf of Mexico and westward to Missouri, Kansas, Oklahoma, and Texas. Actually, I should say muscadines because there are multiple varieties, including the most well known scuppernong. Muscadine grapes have thick skin are huge compared to their northern cousins. In fact, some might be mistaken for small apples. Not knowing much (okay anything) about these grapes or wines made from them, I wasn't sure whether to chill them or not. Wills Creek sent me a white, a red and a dessert wine, so I did the usual -- chilled the white and the dessert. Anyway, I started with the white by tasting Wills Creek Winery's Scupperdyme ($8), which isn't really white at all. Made with the scuppernong, magnolia and carlos muscadine varieties, the color is more of a medium-deep brownish gold. Nena described it as topaz. It is extremely aromatic with aromas of flowers, wet pavement and plenty of the typical "foxy" character often found in native varieties. The palate wasn't foxy at all, strangely, though it was a bit flowery. The dominant flavor was that of super ripe, just-turning-brown bananas. There is some sweetness here, but enough acidity for balance. Next up was the red, Wills Creek Winery Ruby Red ($9), made with red muscadines. As the name would imply, the this wine is ruby red in the glass. I swirled, I sniffed -- and this wine smelled nearly identical to the scupperdyme. There seems to be less floral aroma, but I probably couldn't have told them apart if blindfolded. The flavor followed suit -- very similar but with a little less acidity. But that could have been the fact that it wasn't chilled. Chilling can make acidity more apparent. 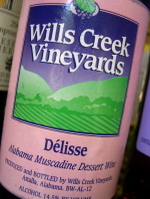 Last in this lineup was Wills Creek Winery's Delisse (N/A), which was my favorite of the three. The color of burnt sugar (think the top of a creme brulee), the aromas and flavors are similar to the other two wines, but there is some nice burnt sugar character that keeps the banana flavors in the background. The balance between sweetness and acidity is really impressive too. For more information, visit www.muscadine.com for Wills Creek Winery. I've written about the wines of Wolffer Estate several times, so I probably don't need to provide much background here. Just know that despite vineyards that have slightly more chardonnay in them than merlot, Wolffer, and winemaker Roman Roth are devoted to Long Island merlot. They are a founding member of the Long Island Merlot Alliance and also create Long Island's most expensive merlot -- their Premier Cru Merlot ($125). 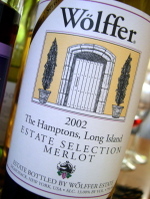 One can easily argue the merits of both a $125 bottle of Long Island wine and the LIMA, but today we're talking about Wolffer Estate Vineyards' 2002 Estate Selection Merlot ($35). Made with fruit from the estate's oldest merlot vines (planted in 1990 and 1991), the nose exhibits ripe but understated raspberry, cherry, cranberry and cedar aromas. Medium bodied, the palate shows nice complexity with red berry, cinnamon, black pepper, mineral and cocoa flavors — all with ripe, gently gripping tannins and understated acidity. For my money, it's hard not to argue for buying three bottles of this in lieu of one bottle of Premier Cru. But, something tells me that people buy Premier Cru less for the wine itself and more just to say that they did. For quite a while now, I've been trying to find some interesting-without-being-lame wine-related t-shirts...with very little luck. Then I tried to find some locally focused ones...with even less luck. So, I decided to create one of my own, emblazoned with "DRINK LOCAL" on the front. The message is clear, concise and one that is near and dear to my heart. And, as much as I hate the idea of "going commerical" I've opened up a GoodStorm shop where anyone can buy one. I've got a few different colors set up right now, but plan to add more at some point. Several of you have also emailed me about LENNDEVOURS t-shirts (a flattering and unexpected development), so I created one of those as well. Who will actually buy them? I'll admit to having no idea. But it would be cool to be out at the wineries sometime and see someone wearing my shirt. Or maybe it would just freak me out. I've got a lot of other local wine-related ideas -- books, calendars and the like. 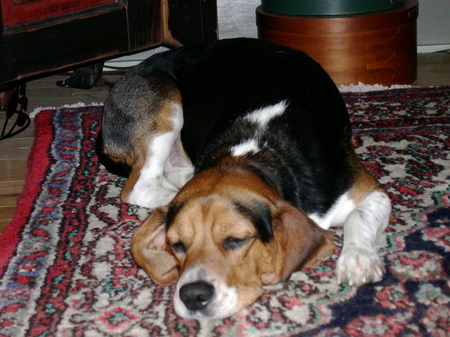 But as Nena often tells me, I'm a man of many ideas and few completed projects. For now, check out the new LENNDEVOURS store. After the watermelon cube amuse, I wrapped some fresh (never frozen) Florida shrimp with a basil leaf and a half strip of bacon and tossed it on the grill. Once cooked (the bacon did a great job protecting the shrimp...I got a little distracted and would have burnt them otherwise! 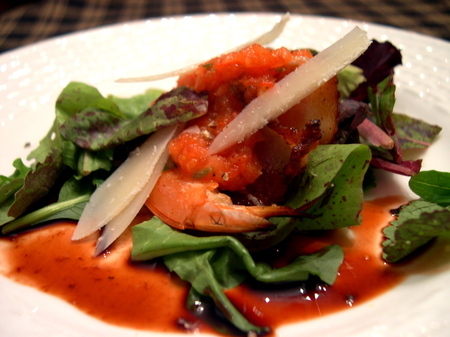 ), I put them on a bed of mesclun from Sang Lee Farms, drizzled with some of the same balsamic-blackberry syrup, fresh tomato sauce and parm reg cheese. The picture isn't great (looks like the syrup is all over the place) but Nena and her parents loved the course. The Lenz Winery has been making a lot of noise lately about its wines and how they rate against top-flight Bordeaux in professional blind tastings. It's an interesting marketing hook to be sure. The recently released Lenz 2001 Old Vines Cabernet Sauvignon ($30) is one of the wines that fared best. And I can see why. It's obviously much more important that consumers like a wine (instead of critics), but something tells me this wine will be well received. "Old vines" doesn’t have any official meaning (much like "reserve") but this rich, deep purple-crimson cab is impressive nonetheless. The nose is dense with raspberries, blueberries and plums and a sprinkling of cracked black pepper and oak. Youthful, but ready for drinking today, blueberry, cassis and plum flavors live within a medium-full body red that features apparent, but very ripe tannins. With 45 minutes or so in the glass, black pepper and cinnamon flavors reveal themselves, adding complexity on a lingering finish. There aren't a ton of local producers making pinot noir here on Long Island. The "heartbreak" grape is difficult to grow anywhere, but with Long Island's humidity, I think it's even harder. I know of at least one winemaker that has stopped making pinot noir completely -- using his pinot grapes strictly for bubbly now. 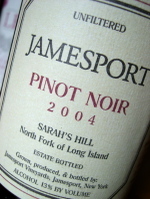 That said, Jamesport Vineyards can usually be counted on for a solid bottling. Owner and vineyard manager Ron Goerler is one of the North Fork's most respected growers and has long been known for growing quality fruit. This wine was fermented using indigenous yeast, and wasn't fined or filtered. Medium ruby in the glass, there are aromas of cherries, plums, oak and tobacco here. If you've been drinking deeply-extracted, somewhat plump or soft California pinot lately, this is a nice diversion. Sweet red fruit is accented by vanilla, cola and oak on the palate — which is light-to-medium bodied, with a velvety texture, food-friendly acidity and just a little tannin on the finish. It's only mid-August, but this is a nice transition wine — either for spring or fall — between white wine and red wine season. 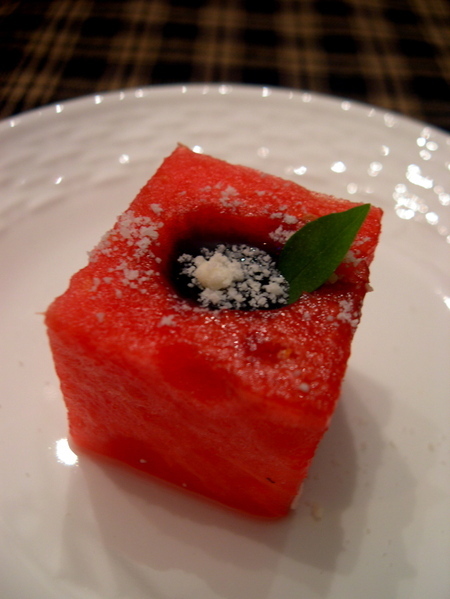 Last weekend I cooked a little dinner for Nena and her parents, and this was the amuse bouche -- a cube of fresh watermelon, balsamic vinegar syrup made with local blackberries, a petit basil leaf and some grated grana padano cheese. I've wanted to make some version of this for quite a while after seeing it over at Obsession With Food, and I'm glad I finally did, with a few modifications of course. Wine Blogging Wednesday #25 Announced -- Champagne. The Real Deal. The Wine Blogging Wednesday train just keep chugging along, and in September Sam from Becks & Post is playing host. I've not met Sam yet (we missed one another when I was in San Francisco in June) but anyone who reads her always fun and entertaining blog knows, the girl loves her Champagne. That's Champagne with a capital C, not sparkling wine. So, it comes as no surprise that she has chosen Champagne as the theme for September 13th edition of WBW. Taking part in WBW is easy. Go out and buy a wine that matches the theme. Drink it. Write about it. Let the host know. Pretty easy right? For WBW #25, Sam is offering bonus props for small producer bubbly -- as long as it's Champagne...from the Champagne region of France. See her announcement for more information. Last week, Nena made her first batch of bread and butter pickles (more on that later). Apparently Ben was heavily involved in the process, because he found it exhausting -- as you can see. I've gotten a few emails about my post a couple of weeks ago about the Wine Advocate's recent coverage of New York wines, charging that I was overly negative and (shockingly) dismissed David Schildknecht's credentials. Re-reading my post, I still think I was pretty even handed, but I wanted to offer a few more thoughts to make sure that my feelings are clear. Now hear this -- this is a milestone for NY and Long Island wines. There is no disputing that, regardless of what you think of the 100-point scoring system, Parker or his influence on consumers. This is the most complete, single publication, review of Long Island wine. It is sure to bring further attention to the region and its wines. That's a good thing. It also brings legitimacy (where there may not have been) to the region in the eyes of that subset of wine consumers who either had bad experiences with Long Island wine in its infancy or who follow Parker scores blindly. Legitimacy, again, is a good thing. But, too often wineries hang their hats on scores and awards. How many wineries don't say "award-winning wines" in their brochures or on their website? I do a lot of my research online, and almost to a winery, that phrase appears somewhere. So, I think the enthusiasm over the WA coverage, while deserved, shouldn't run wild without a realistic view. For instance, of almost 40 Long Island wineries, only 15 had at least one wine score an 85 or higher. Further, only 7 scored a 90 or better. And the highest score was a 92. Do I think that 92 is the ceiling for local wines? Absolutely not and that is not my point. I fully expect that when some of the 2005s I've tasted in barrel are release and reviewed, they will score significantly higher than that. I think some of them will crack the 95 barrier. Ultimately, it is the consumer who will decide if Long Island (and New York) wines are a good as I think they are. The fact is, while Schildknecht's commentary talks about the potential of the region going forward, most consumers aren't going to see that. They are going to see wines on store shelves with little cards that max out at 92 and $50...right next to $10 wines from other regions with a similar score. Yes, Schildknecht's review of the region is a milestone, but it's an early milestone in the overall timeline of Long Island wine. That's all I'm saying. Oh, and to the reader who accused me of bashing Schildknecht or discrediting him, please re-read my original post. I did nothing of the sort. In fact, without meeting him, I'm impressed with his ability to taste wines and write terrific tasting notes. And, every winemaker I spoke to came away saying he was a focused, meticulous taster with an impressive palate. I hope to meet him one day, hopefully when he visits again. The 2nd Annual Hamptons Wine & Food Festival is this weekend. The organizers have gathered a nice roster of celebrity foodies and wine experts this year, including Food Network personalities Sandra Lee and Dave Lieberman, wine experts like Josh Wesson and Mark Oldman, and Top Chef winner Harold Dieterle. Last year, I didn't talk much about the event -- because they didn't have any local wines there. Instead, they got a big distributor to sponsor the event and poured those. This year, however, they've changed that with local winemakers Kareem Massoud (Paumanok Vineyards) and John Levenberg (Bedell Cellars) on board as speakers and several other wineries will be pouring. Sadly, other obligations will keep me from going, but there are some great classes and sessions planned. Anthony Road Winery, which released its first wines in 1990, is on the west side of Seneca Lake. Owned by Ann and John Martini, the wines are made by Johannes Reinhardt, a German native. Reinhardt grew up in a family that has been in the wine business since 1438, so he's been in vineyards and wineries just about all his life. With his German background, it is no surprise that he ended up in the Finger Lakes, where the best wines of Germany, particularly riesling, thrive. This wine, however, is a first for me -- a non-dessert wine made from the vignoles grape. Vignoles, also known as ravat, is white hybrid that is most often found in dessert wines because of its high sugar content...coupled with high acidity. Because it grows in small, tight clusters, it is also very prone to botrytis or noble rot. This wine is made in extremely small quantities and is only available in their tasting room. Light gold in the glass, the nose is suprisingly complex with apple, pineapple, honey and flowers. I sense light residual sugar here to go with ripe melon, citrus and pineapple flavors. There is plenty of acidity to balance the sugar and fruit flavor, making this a refreshing pour, even if the finish is a little short. Several times back in May I wrote here about how busy I was with "various writing projects" -- one of which I couldn't discuss beyond that. It was probably the single most exciting thing I've done thus far as a result of LENNDEVOURS and I'm happy to report that the gag order has been lifted. Many of you are familiar with Chocolate & Zucchini, one of the world's most popular culinary blogs, and its founder Clotilde Dusoulier. Any fan of C&Z knows that Clotilde been working with a book U.S. publisher on a cook book. Well, I'm proud and honored to say that her book will also include wine pairing suggestions -- suggestions that I contributed. In what can only be described as a whirlwind of tasting, editing and writing, Clotilde and I worked through each of the book's recipes and picked a wine for them. Again, I'm honored to have been asked in the first place and I'm proud of what we came up with. Of course, she didn't make it easy on me -- and that was part of why I signed on. The first rule was that the wines had to be from "varied regions." Second, most of the wines had to be affordable for every day consumption and widely available. She also challenged me with some or her creative recipes. Obviously I can't go into details at this point...but there are some stellar ones in this book. Clotilde has been so great to work with. Her enthusiasm, curiousity and professionalism are an inspiration and I can assure you that this is going to be a book worth reading, not just another cook book. So that's the big news. As the book is closer to publication and release, I'll let everyone know where they can get their copy. Later this month, Roman Roth, the winemaking talent behind the wines of Wolffer Estate, Shinn Estate Vineyards and Roanoke Vineyards, will show off his garagiste side. Translated from French garagiste literally means “garage owner," but in the world of wine, it's used to describe a winemaker who produces small lots of high-quality, handcrafted wines – sometimes right in his or her own garage. And while Roth didn't make his private label — Grapes of Roth — in his garage, he's embraced the garagiste philosophy, crafting fewer than two hundred cases of his 2001 Grapes of Roth Merlot ($50). Roth grew up in a wine-loving family in Germany and started his winemaking career early. "I was 16. My father was a cooper and a winemaker before starting a wine and beer merchant business. As a result, both of my parents were wine lovers and collectors. Wine always played a special part in any occasion. I was intrigued by the winemaking process and all the different [wine] regions in the world. The creative aspect and the opportunity to travel ultimately made me stay in the business." After his initial apprenticeship at the Kaiserstuhl Wine Cooperative in Oberrotweil, German, Roth worked briefly at Saintsbury Estate, a respected winery in Carneros, California as well as at Rosemount Estate in Australia. In 1992, he joined Wolffer Estate as both winemaker and general manager. It was a 1997 trip to Burgundy, however, that inspired Roth to create Grapes of Roth. "This trip marked a turning point in my career. To tour and travel in this unique area that grows and produces some of the greatest wines in the world helped to define my three goals in winemaking — food friendliness, longevity and to be authentic to a region and a traditional style. Little plots of land, multiple lots in the cellar producing individual, hand-selected and crafted wines — it was here that the seed of Grapes of Roth was sown." So, in 2001 — one of the best vintages ever for Long Island — Roth chose a special block of merlot from Martha Clara Vineyards on the North Fork to make his first Grapes of Roth release. Unfiltered and unfined, Roth's 2001 merlot is a deep, opaque brick red in the glass. Highly aromatic, the nose is rich and youthful with intense black cherries, grilled steak and Moroccan spice. As is true with most Roth creations, this wine is fruit forward, but balanced — with cherries, spearmint, sweet basil and faint smoked meat flavors. Full bodied but still remarkably elegant, this is a wine of nearly ideal balance that should improve with cellar time — probably up to ten years. Roth has dedicated this wine to his father, Remigius Roth, who is pictured on the front label. 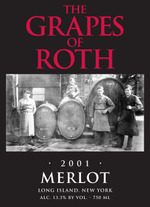 To order Grapes of Roth Merlot call 631-725-7999 or email info@thegrapesofroth.com. Tvino oday, Wine Blogging Wednesday turns two years old -- and this founder couldn't be prouder or happier. What started with a brief exploration of New World, non-U.S. merlot eventually moved onto unique themes like Wacky Name Wines, Obscure Red Varietals and Drinking Local -- Real Local. It's been an interesting ride, that's for sure, and I hope one that has been fun -- and educational -- for those participating. This month, it seemed only right to have Alder of Vinography host the event, considering he is best-known of all wine bloggers. Instead of forcing us to drink something from his home state of California, he asked us to take a tasting trip to the Loire Valley region of France. Now I usually try to wedge a New York wine into WBW where possible. Could I slip a local chenin blanc (from Paumanok Vineyards) past Mr. Yarrow? Nah...it's gotta be a wine from the Loire, not just one from a well-known Loire variety. So what would I drink? I've had several Muscadets in the past, but they all taste about the same to me. And, as someone who doesn't eat shellfish, they aren't that interesting. Sancerre, made with sauvignon blanc, are terrific, but oddly the wine shop that I went to for this WBW didn't have any (very odd in fact). 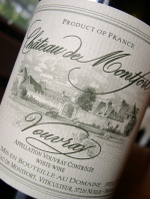 Actually, this shop only had Vouvray, made with chenin blanc -- and it only had one: Chateau de Montfort 2004 Vouvray ($13). I didn't mind though -- Vouvray and chenin blanc are things I've not experience all that much. Pale and almost watery yellow in the glass, the nose is of medium intensity. Clementine oranges, minerals, honeydew melon and green banana make up a surprisingly complex nose at this price point. The first sip greeted my tongue with a little sweetness (Vouvray can vary quite a bit in this regard), but the lightly sweet forepalate led to a nicely balance mid-palate and medium-short finish. The flavors are a bit less interesting and complex than the nose, with mostly melon and citrus flavors. This strikes me as a great summer wine with its light-to-medium body, fresh fruit flavors and refreshing acidity. I usually warn against over-chilling most whites, but a full chill seemed to accentuate the crispness here, so go for it. Thanks, Alder, for hosting this time around...and thanks to all of the WBW participants over the last 24 months. Raise your glasses tonight and toaste the next two years (and many more).